In a major gaffe, the BJP manifesto released earlier in the day promised "laws to commit crime against women" while apparently meaning the opposite. The blooper was spotted by the Congress, which shared a screengrab of the same on social media. No sooner, Twitter went berserk making the ruling party a subject of ridicule. The faux pas was made in the BJP manifesto while stating that the Women's Security Division in the Ministry of Home Affairs would be directed to propose more laws for increasing the security of women. 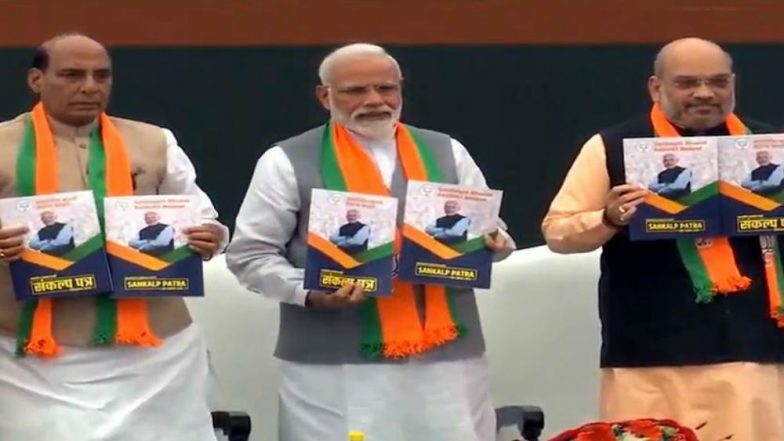 BJP Manifesto Full Text: From Construction of Ram Temple to Uniform Civil Code, Here's A List of Promises. "We have constituted the Women’s Security Division in the Home Ministry, and have made strict provisions for transferring the laws in order to commit crimes against women," the manifesto read. Congress' social media in-charge Divya Spandana attacked Prime Minister Narendra Modi over the gaffe, saying that it has exposed his and the ruling party's "real mindset". "(This is) the asli mindset of Modi and the BJP. Don’t get carried away with the botox pictures you see on hoardings, not the face but the mind matters," the former MP said.